If you’ve had have no experience with French Bulldogs, you are in for a wonderful surprise. For one thing, they aren’t like other dogs. 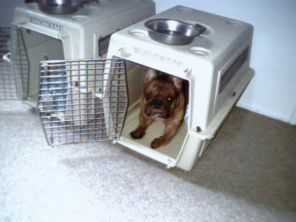 These few guidelines may help you and your new Frenchie adjust to living together with a minimum of difficulty. Historically, they have been the companions of factory workers and harlots, they have been the favored pets of royalty (King Edward VII of England, and the Romanovs of Russia), they have been the rage of Paris, and the status symbol of wealthy Americans. 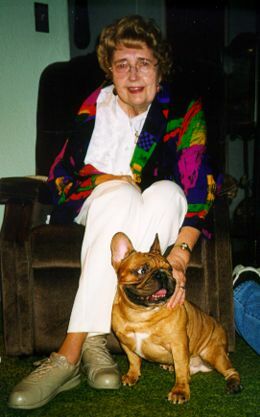 A prized French Bulldog even went down on the Titanic. Today they are a rare breed, but are gaining in popularity. Their distinctive look and winning personality are gaining them attention everywhere.They are small without being hyperactive, intelligent without being overbearing, loving without being demanding. They are good indoor/outdoor companions. They require relatively little space and relatively little exercise. They aren’t without their special needs, however. Overheating: All flat-faced (brachycephalic) breeds have this in common, that they don’t tolerate a lot of heat. Dogs regulate their body temperatures by panting, and flat-faced breeds have less surface area for heat loss in their nasal cavities (and in their lungs). Rule of thumb: if it’s too hot for you, it’s too hot for them. If your Frenchie is panting and rasping, it should be cooled down. Take it someplace cooler, give it water. If necessary, wet the dog down. They aren’t yard dogs to be left out in the sun in summer. Never leave one unattended in a car, even on a mild day. Make sure there is water available for them to drink, especially during summer. Cold weather: The same rule applies: if it’s too cold for you, it’s too cold for them. They aren’t going to be yard dogs in winter, either. A respiratory virus can be devastating. Better for them to be indoors and protected, especially on winter nights. Grooming: Frenchies require little regular care. Bathe a Frenchie when you feel it is necessary using warm water and a quality dog shampoo. Towel dry. Clean their ears regularly with a moist q-tip. This helps avoid infection. Watch for ear mites, which will require special treatment. (If you get a lot of red-brown waxy gunk out of the ears, chances are it’s ear mites. See your vet.) Nails should be kept short, either clipped or ground down.Shedding may occur in spring or fall. There is little to do but brush them frequently, or bathe them regularly to remove the old hair. If your Frenchie sheds continually, consult your vet to make sure it isn’t a hormonal or dietary imbalance. Diet: Frenchies can be little chow hounds, and are exceptional at begging human food. While a treat every now and then may not do any harm, don’t make a habit of it. They will quickly become overweight, which can tax their circulatory systems, and create additional overheating problems. A quality dry dog food will do them just fine, with a splash of water added. Puppies should have 2 meals a day, each being about 2/3 cup of small-bite kibble. At least once a day, add a heaping tablespoon of cottage cheese to the kibble, for Calcium and fats (keeps the coat shiny). Until 6 months of age, puppies should have a minimum of people food. Stick to dog food until their bodies are developed. Adults depending on activity level, they should get one meal a day, consisting of 1 to 1 2/3 cups of dry food, moistened with water. Watch their weight. They should not be fat or flabby. These are muscular dogs.If your dog is constantly begging, but is growing fat, try giving it a piece of carrot or celery. Dogs are omnivorous, and will usually enjoy the treat. For summer, frozen baby carrots make a nice treat. Canned food or meat added to a meal can be a treat for Frenchies. Watch their weight if you do it often. Also, beef (or any sudden dose of protein) may give an unaccustomed dog a mild case of diarrhea. Daily vitamin supplements are debatable. If you are using a premium quality dog food, you probably won’t need any. If you use the cheap stuff, vitamins are probably a good idea. If your Frenchie won’t eat, check with your vet to rule out health problems. If you still can’t get it to eat, try boiled white rice, with pieces of boiled chicken (no bones!). Or try adding garlic to the food. Sometimes the problem is emotional, and will correct itself if the dog is given a little extra attention and concern. Sleeping Quarters: A dog crate can be a wonderful thing to have around. 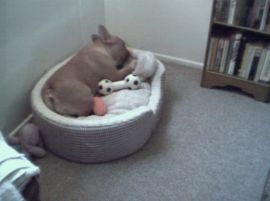 Filled with bedding, it provides a secure environment for the Frenchie at night. It becomes their little home, someplace where they feel safe. With the door closed, you don’t have to worry about the Frenchie getting into mischief while unsupervised, or when you don’t want your Frenchie jumping on house guests. Once established, their sleeping area should not be moved around unreasonably. Constant change will make the dog insecure, and will result in undesirable behaviors. Make sure their sleeping environment is not too cold in winter. (On the back porch won’t work!) And make sure that if they are going to spend time during the day in the crate, that it isn’t sitting in the sun. Also, give them water, especially in summer. There are little dishes that hook directly onto the door of the crate. Toys and Treats: All dogs love toys and treats. Be watchful for any toys the dogs might splinter or tear up into small pieces that could lodge in the throat. Discard toys that become worn from use. Don’t give them rawhide items or those “chicken sticks” available insome stores. They splinter up badly and can inflame a Frenchie’s throat and cause choking. 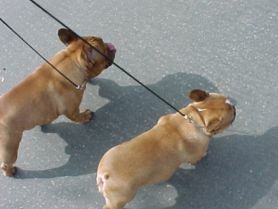 Training: French Bulldogs will do anything you want them to do, as long as they want to do it, too. They are intelligent and easy to train. But they can be stubborn. They understand fairness, and overly harsh or unjust punishment will bring out resentment. No matter what it is you want them to learn, be encouraging. Treats work wonders. Correct bad habits early; once established, bad habits are hard to erase. Housebreaking is not difficult, as long as the dog is encouraged to go where you want it to from the start. Especially with puppies, take them to use the bathroom right after they eat. You will find that they are creatures of habit; they will quickly find their favorite spot, and will go there every time. Understand that bad behaviors (soiling, tearing things up, excessive barking) are usually a result of our not being in harmony with them. Figure out what is bothering them, and approach the problem from a standpoint of making things right for them as well as for you. Take away the cause of their frustration, and you will erase the behavior. Walks Depending on the age and condition of your Frenchie, a modest walk in mild weather should do it good (and you, too). But be alert to overheating. Anything over a 10-15 minute walk will probably require that you carry the Frenchie back. For a collar and lead, use one that is comfortable for your dog. It doesn’t need to be massive. (This isn’t an unruly rottweiler!) Make sure you can get two fingers under the collar when it’s on. The Vet: You need to take your Frenchie to your vet as soon as possible after purchase. Your vet will check the dog over for any problems, and assure you that you have a quality Frenchie. (Is your vet familiar with the special needs of brachycephalic breeds?) Show your vet the inoculation history, and set up a schedule for future inoculations. You shouldn’t have recourse to visit your vet frequently, but remember that you have a valuable animal. A little preventive maintenance can go a long way. It pays to have a regular vet who is familiar with your animal. Find out where the closest Animal Emergency Clinic is, in case of an after-hours emergency. Breeding: This is why breeders call them the “heartbreak breed”. If you intend to breed your Frenchie, read up before you do anything. Talk to breeders. Remember: the females usually can’t freewhelp. They will require cesarean sections. Don’t assume otherwise, or you stand to lose the mother as well as the puppies! The first month the puppies are on the ground is critical, as well. Learn the pitfalls before you even consider a breeding. You will get out of your Frenchie a thousand percent of what you put in. But that means if you neglect the dog, or do things half-way, what you get back may not be satisfactory. Again, a little patience goes a long way. Frenchies are anxious to please, but sometimes it is hard for them to understand what it is that pleases us. If you follow these basic guidelines, you and your French Bulldog should have a long and happy relationship. Congratulations!